What sort of mischief would two tweens who grew up on a space station get into? Why, inventing new species and saving the day of course! 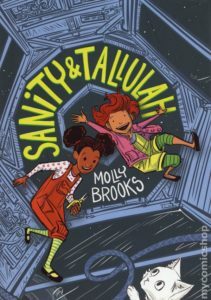 Sanity and Tallulah are best friends and children of VIPs on board their space station home. Sanity is the smarty pants who spends her time experimenting and futzing with mechanics, usually on the sly and not quite in the realm of what her parents would allow. Tallulah is along for the ride, though she prefers gushing over their favorite comics and avoiding homework. When one of Sanity’s experiments appears to be dismantling the space station, the girls set out secretly to find it before their parents can have the creature “taken care of.” But other factors may be at play and it may be up to the girls to save the day. Looks like this is a graphic novel is the first in a new series, though she has also penned two single-issue companions available online. The artwork is absolutely adorable. Diverse cast of characters – check! Interesting futuristic fashion – check! Delicious colors – check! Cats – triple check! I love that we are plopped into this “slice of life” on a space station (as opposed to the tons of dystopian space station drama I usually read) and the bizarre science behind it (taffiology? as in literal taffy as an energy source? weird!). It would be perfect for younger tweens who need a gentle introduction to sci-fi. That being said, it does have a slow start and sometimes it’s confusing being dropped in the middle of this space-station with no backstory. But those issues aren’t dealbreakers. Share the post "Princess Sparkle Destroyer of Worlds"
I'm a librarian, a singer, a cosplayer, a baker... maybe an overachiever. @cosbrarian on Instagram and Twitter!